On October 16th, Mr. Bin Pu, the executive deputy director of Chengdu Innovation and Entrepreneur Demonstration Committee, Ms. Zhongyan Lai, the deputy director, Mr. Jian Tang, the minster of International Cooperation Department, Mr. Nelson Lee, the president of Sunels Group, and Mr. Will Zhang, the deputy general manager of STCC International Park visited the U.S Consulate General in Chengdu and met with the Consul-General Mr. Jim Mullinax. 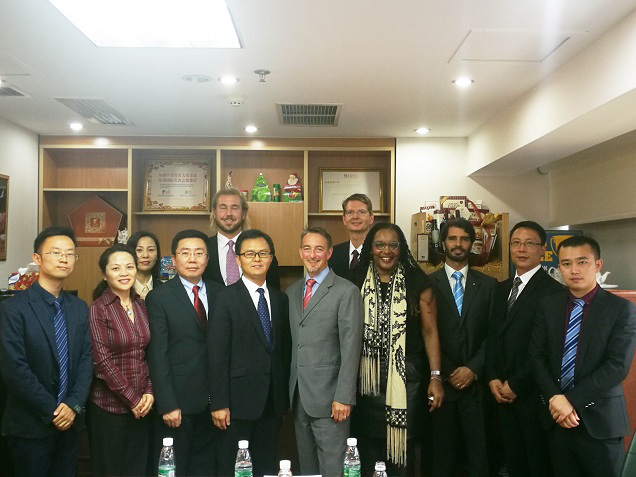 The Director of Agriculture Trade Department of the U.S. Consulate General in Chengdu, the director of Commercial Department, and the enterprise representatives from the United States and Portugal also attended this meeting. Mr. Pu introduced ecological and investment environment in Pidu District, emphasizing on the development of electronic information, food and beverage, research and development design, and cultural creative industries. Mr. Pu said that currently Pidu District was creating the international community, and welcoming U.S agricultural goods to export to China. Pidu District also expected local companies to face the international market and enter the U.S. market. Pidu District would create a good business environment, providing convenient and high quality service for American enterprises. Mr. Pu also invited Mr. Jim Mullinax and other consulate officials to visit Pidu District, taste the Pixian Douban, learn about Sichuan cuisine and look for further cooperation opportunities. 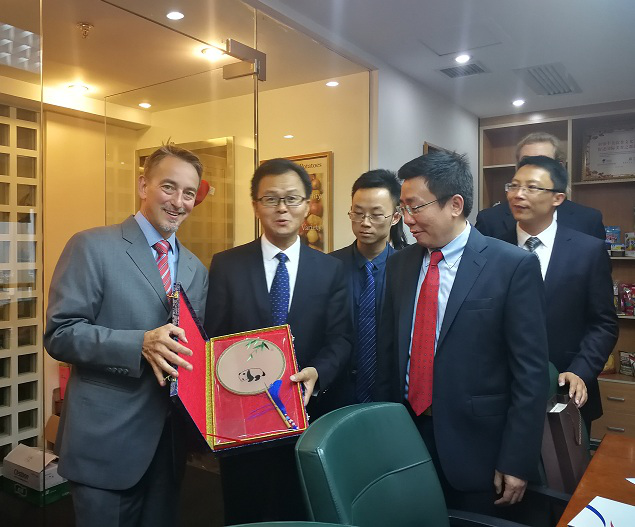 The officials of Agriculture Trade Department and Commercial Department introduced their business areas, enumerated the details of how to help American companies to expand Chinese market, and shared the information of Sugar & Wine Exhibition. The Commercial Department will also plan to provide “Golden Key Service” to U.S. enterprises which move into Pidu District, helping them connect to nationwide resources across all industries. Mr. Jim Mullinax, consul-general, welcomed and thanked the Administration Committee and Sunels for the visit. He also expressed his views on the trade issues of common concern to Chinese and American enterprises. Both sides agreed that trade frictions are only temporary at a special time in Sino-U.S. relations, we should overcome difficulties, enhance communication, deepen understanding and enhance mutual trust. Nelson Lee, the president of Sunels Group, introduced the service model and the excellent office environment of STCC Park. According to Nelson, Sunels is a bridge between American enterprises and Chinese market, helping Pidu District to provide more high-quality and convenient services for foreign outstanding enterprises. The representative of brewer industry from Minneapolis in U.S. exchanged their views and opinions with Agriculture Trade Department on beer brewing industry tariff and local promotion in Pidu; The representative of enterprises from Maryland will keep communicating with officials of the Commercial Department promote in China. The Portuguese food company also shared their entrepreneurial ideas and future expectations.